Mounting a very heavy school bus video or vehicle camera system DVR directly over the drivers hands on the steering wheel is a potential accident waiting to happen. At the very least increase the usual 4 screws used to mount the lock box to at least 16 mounting screws to insure they do not shake free, also where is the top half of the clamshell lock box on this school bus video or vehicle camera system? In this current configuration all that is holding the VCR in place is a small velcro strap. 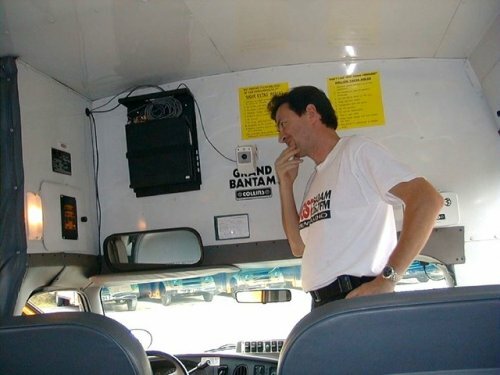 Whether it involves school bus cameras, digital bus video cameras, vehicle camera, mobile video surveillance systems, digital in-car video camera, in-car camera, bus camera surveillance it is always best to invest in 100% Solid State digital like the SD4m or SD4 series, small DVR mountable under dash where it will not present a hazard to driver or children.